Immobilization is the forced restriction of movement of all or part of an animal’s body, either by physical or chemical means. It is used to impose management of some kind, for human and/or animal benefit. Immobilization is a common practice in many animal management procedures. Here we’ll examine the impact of immobilization on welfare, outline the ethics of use in different situations, and consider ways of improving standards in these areas. Physical immobilization methods usually involve traps to restrain the whole animal (eg. pitfall traps, cage traps, box traps, crush cages, plastic tubes, restraint boards, restraint chairs), or part of the animal (eg. snares, leg-hold traps, chutes, head-holding devices) or just use direct handling restraint. Chemical immobilization is achieved using drugs, which have a range of intended effects, from those which produce a widespread muscular paralysis while the animal is fully conscious, to those which produce unconsciousness with anaesthesia (lack of sensation, eg. of pain). Immobilization is a welfare issue. Immobilisation of an undomesticated or anxious animal may cause considerable stress. When animals are immobilized they may undergo some or all of a series of acute stressors including pursuit, restraint, pain, fear and anxiety, all of which are capable of inducing harmful responses and pathological changes. Repeated stressors, such as are imposed on some laboratory and wild animals are likely to result in very poor welfare outcomes. Animals in physical traps experience stress similar to being caught by a predator; but their struggle to escape may continue until released from the trap. Traps may be remote from the human who set them, and a trapped animal may be left unattended for long periods. 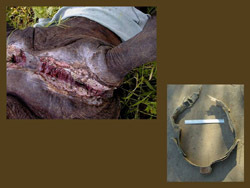 Physical injury is also a risk, for example steel-jaw leg-hold traps, widely condemned as inhumane, cause high levels of fractures and tissue necrosis in target and non-target species. A good account of capture and physical restraint techniques for zoo and wild animals is given by Todd Shury (2007), and a general veterinary account by Sheldon et al. (2006). With chemical immobilization there are different welfare issues. Immobilizing drugs have the potential to disturb normal regulatory systems, particularly respiratory and thermo-regulation, which in turn can lead to negative outcomes such as respiratory depression, over-heating (hyperthermia), lowered blood pH (acidosis) and oxygen deficit (hypoxemia). These can lead to neurological or myocardial problems and multi-organ failure. A chase by ground or air to dart an animal can lead to extreme muscular activity and hyperthermia, and a potentially fatal outcome, capture myopathy syndrome, which can lead to death in minutes to weeks after the inciting event. Drugs may behave differently in combination, and in individual animals depending on their physiological status. Dosages often have to be estimated (for animals of unknown weight), and where drugs are remotely delivered by unpredictable darts to a moving target animal delivery of the correct dosage is very difficult to control. These scenarios would present a nightmare for a human anesthesiologist, as would the resulting morbidity and mortality rates, but both can be routine in situations where wild or un-tamed animals are immobilized. Wildlife researchers may need to immobilize wild animals to mark them for later identification, to provide veterinary treatment or to relocate them from dangerous or over-populated areas. Marking may involve ear notching, digit or tooth removal etc, tagging and banding, or radio-transmitter attachment (external or internal). In the last 20 years the immobilization of wild animals for the fitting of tags and markers has increased dramatically to the point where this is the starting point for many monitoring studies. Wildlife immobilization often employs chemical means. The immobilization of large or potentially dangerous wild animals may pose huge challenges with risks for both operators and target animals. Drug choices and combinations must be of proven safety for each species and calculated for the weight, age, physiological and reproductive status, body-condition and presence of young or companions with the target animal. If the onset (induction) of anesthesia is slow, this increases the risk of physical injury such as lacerations, limb injuries, head trauma etc. It isn’t surprising that capture and immobilization related mortalities in wild animals are more frequent and more serious than in domestic animals.